Welcome back. Would you like to come along on my research instead of my review of published research? There’s a large growth on a roadside tree stump. It’s the kind of fungus you might want for an art project. Growing up, I used to see them painted or drawn on in shops and people’s camps when we visited the Adirondacks in the summers. Years later, I’d occasionally see them at craft fairs. I’m not after a new hobby and I’m not partial to that kind of art; but I am curious about, well, everything to do with the fungus and process. Any interest? If you’re already into mycology--the study of fungi--you’ve nothing to gain. If you come along, though, feel free to correct my mistakes. 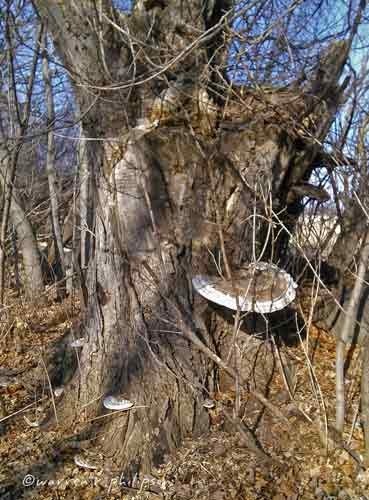 I know it’s a fungus growing on a tree and online searching gets me to tree bracket fungus, shelf fungus, shelf mushroom, horseshoe shelf mushroom, conk, artist’s conk, fungal conk, shelf conk and more. From photos and field guides, I’m pretty sure all of the fungi on the tree stump are Ganoderma applanatum. Coming up with the genus and species was easy. Trying to lock down the higher taxonomy sent me on one tangent after another. (That’s often the interesting part of research.) The one botany course I took was long forgotten and whatever it may have taught me regarding fungi classification has changed anyway. In those days, fungi were still classed as plants instead of having their own kingdom. Much more recently, scientists found through DNA sequencing and cell comparisons that fungi are more like animals than plants. Although the taxonomy is still not fully defined, the best choice for our tree bracket fungi seems to be the Fungi kingdom, the division (or phylum) Basidiomycota, the order Polyporales, the Ganodermataceae family, and again, the Ganoderma genus and Applanatum species. 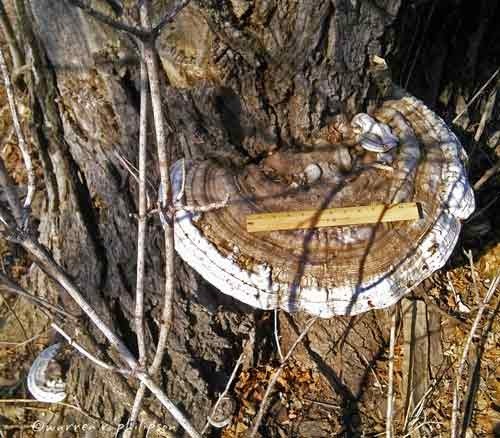 Tree bracket fungi are inedible, perennial and parasitic, saprotrophic, or both, living alone or with others, possibly clustered, on dead and dying hardwood trees. with a 12 inch ruler. They generally grow shelf-like in semi-circular shapes, in sizes from tree to edge of up to about 8 inches--sometimes much bigger obviously. Slicing the fungus in half should reveal layers, one for each year, like tree growth rings. The fungi’s upper surface is hard, wrinkled or furrowed, and a dull white, gray or brown with a white edge. The bottom surface, the art palette, is white or graying and subject to staining where it’s touched. Each bracket fungus produces an enormous number of spores, which are distributed by wind and may grow new fungi. 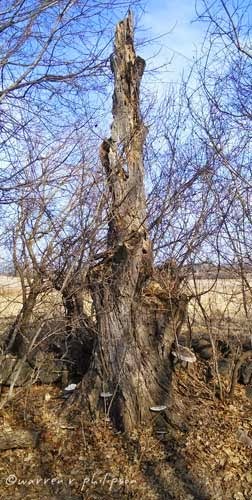 Detaching the fungus from the tree is accomplished by cutting with a saw or hatchet if pushing down from the top fails. If art work is planned, matching the art technique with the removal schedule is recommended. If it’s intended that the tree fungus art will stand on its own, the base should be carved level before it dries further. Should you paint, burn or try some other medium? Do you need a primer or protective coating? I’ll leave all that to you. There’s no shortage of information and examples--including bronzed fungi door handles (see Etsy link below). Me? I’ve learned what I was seeking, and I’d rather see the fungi on the tree stumps than removed for an art project. Come back next Tuesday and I’ll show you some of the others. Thanks for joining me.